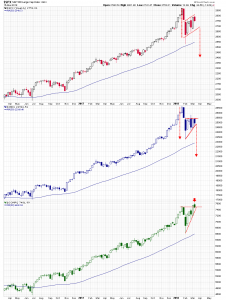 The broader market indices finished the week looking weak. The bounce off the February low has been impressive, but it’s been a process and part of that process requires pullbacks. 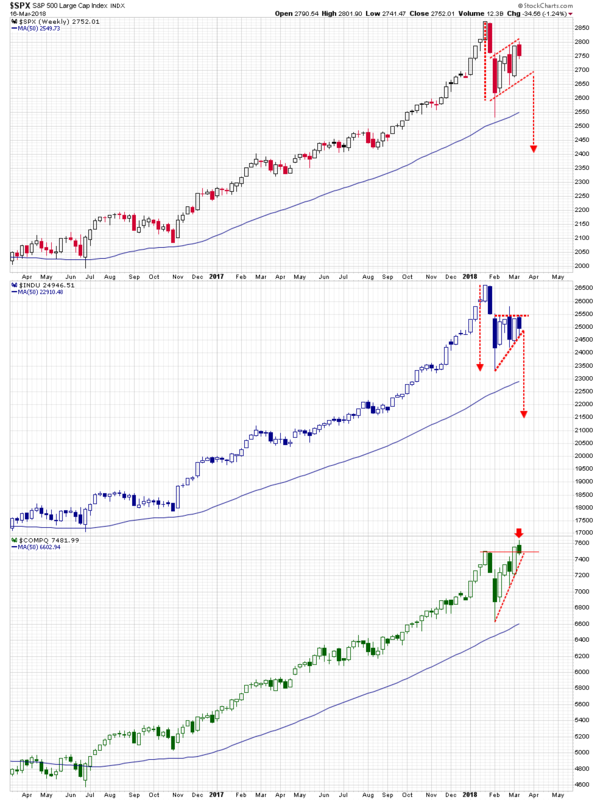 Next week we could see some retracement which could either be healthy for the market, or could take the indices down through some important levels of support. Let’s start with a look at the weekly charts. There is a bearish flag-like pattern on the S&P 500 chart. This week, after touching the flag resistance line in the 2800 area, a dark cloud cover candle formed over the previous week’s candle. The implication of this dark cloud candle is that next week the index could begin moving back down, towards another test of the rising support line of the flag, in the 2700 area. The pattern on the DJIA chart is similar to the one on the S&P chart. 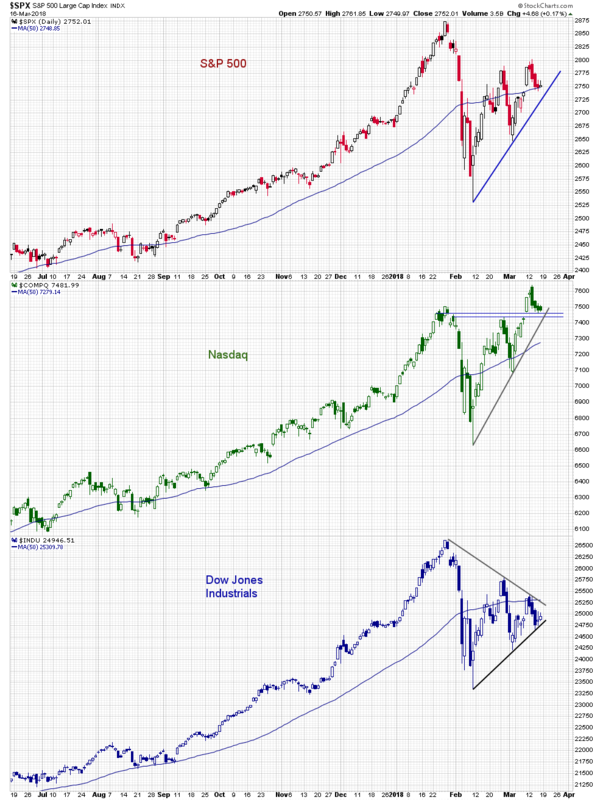 Flag support on the Dow chart is closer on a percentage basis than flag support on the S&P chart. If retests of these flag support levels were to happen, the industrial index would probably test first. How well it handled such a test would be a major influence on the S&P index. Despite some recent weakness in the notable FANG names, last week the NASDAQ Composite Index managed to make a new all-time high. It started this week by opening above the previous week’s high, but closing below it, and below the previous January high. If there is further deterioration in the FANG names the Composite will break its steep short-term trend line. But it does not necessarily follow that breaks in these weekly support lines will precipitate major moves lower, although the flag pattern’s measured moves do project to considerably lower levels. Secondary base lines could form and contained pullbacks could evolve into horizontal channel patterns. There are, of course, any number of less volatile outcomes. The daily charts show the support areas more precisely. Right now the S&P index is sitting on its 50 day moving average. The 2725 level looks like flag support. Break down confirmation would require two consecutive lower candles closes below this level. NASDAQ support is situated between the 7440 and the 7460 levels. Its 50 day average is currently about 171 points lower and would be the next logical level of support, should the composite index breakdown. Finally, the Dow has been trading in a symmetrical triangle or wedge pattern on its daily chart. Triangle support is in the 24,700 area. It is currently under pressure as the index nears the pattern apex. What all this implies is that the indices look fatigued and in need of a recovery period. This could mean a period of lateral movement or a pullback. The risk of a pullback is that when certain technical or psychological levels are breached their failure could initiate further selling. But what if the market is firmer next week and after several days of gains the flag resistance levels are taken out? That would quickly turn the conversation to talk of DOW 2900 and take the NASDAQ to new highs. 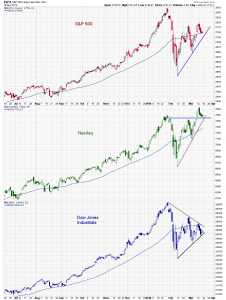 I think the bearish scenario is more likely not just because of the weak looking index charts, but because of the technical weakness in names like Salesforce.com (CRM),Apple (AAPL), Alphabet (GOOGL), Intel (INTC), and Home Depot (HD). I’m not suggesting shorting the market, rather to simply be aware of the fragility of some of the big names and the broader market in general.